American radio host and conservative political commentator. His nationally-syndicated talk show, The Rush Limbaugh Show, airs throughout the world on Premiere Radio Networks. He has been credited with reviving AM radio in the United States, and is considered to have been a "kind of national precinct captain" for the Republican Party's Congressional victories in 1994. National Review magazine, in a 1993 cover story, called him "The Leader of the Opposition" during the Clinton presidency. 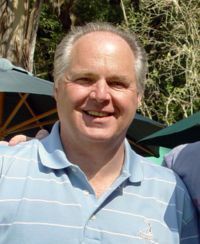 A month after Bill Clinton's defeat of the the Elder Bush in 1992, Ronald Reagan sent Limbaugh, a man he never met, a letter in which he thanked Limbaugh "for all you're doing to promote Republican and conservative principles...[and] you have become the Numb American radio host and conservative political commentator. Is this you? Let us know. If not, help out and invite Rush to Goodreads.